These popular Italian treats are made by boiling and then baking small, seasoned, circles of dough. 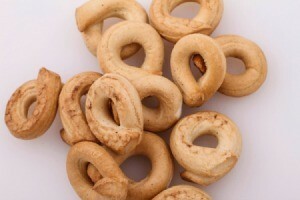 This page contains Italian pretzel (taralli) recipes. Does anyone have a recipe for Italian tarallis. They are round, hard, and have fennel seeds. Sometimes called Italian pretzels. Dense Italian bagels, these fennel seasoned little breads boil briefly before baking. This is a very high volume recipe that is easily halved for a more manageable quantity." 1. In a small bowl, dissolve yeast in water. Let stand for 5 minutes. 2. In a large bowl combine butter or margarine, sugar, salt, and egg. Add yeast mixture and 1/2 of the flour and mix until smooth. Stir in the remaining flour and the seeds. Mix in additional water as needed to make a stiff dough. 3. Turn dough out onto a lightly floured surface. Knead well. Place dough in a lightly oiled bowl, and turn once to coat surface. Cover with a damp cloth and place in a warm spot to rise for about 1 1/2 hours. 4. Roll dough into short ropes about 1/2 inch thick. Join ends to form donut shape. Set aside to rise for a few minutes. 5. Preheat oven to 350 degrees F (175 degrees C). 6. Fill a large saucepan half full of water; bring to a boil. Drop taralli into water and boil for 1 minute. Remove from water, letting both sides dry on a sheet of waxed paper. 7. Bake at 350 degrees F (175 degrees C) on a lightly greased cookie sheet, turning a few times during baking until medium brown and crisp. You can find this recipe at Mary Ann Esposito's site, CiaoItalia.com. I think that the recipe that you are looking for does not call for yeast. My grandfather is Italian, and he got his recipe from my great-grandmother straight from Italy. You can find a similar recipe on Cooks.com, but the recipe is not very clear. He is supposed to be sending me a recipe soon, when I get it, hopefully, I will remember to send along a copy to you. It is very difficult to find this recipe. His Italian pizza is even harder to find.